Les Caprices de Star, 2005. Retail Price $100 US dollars. 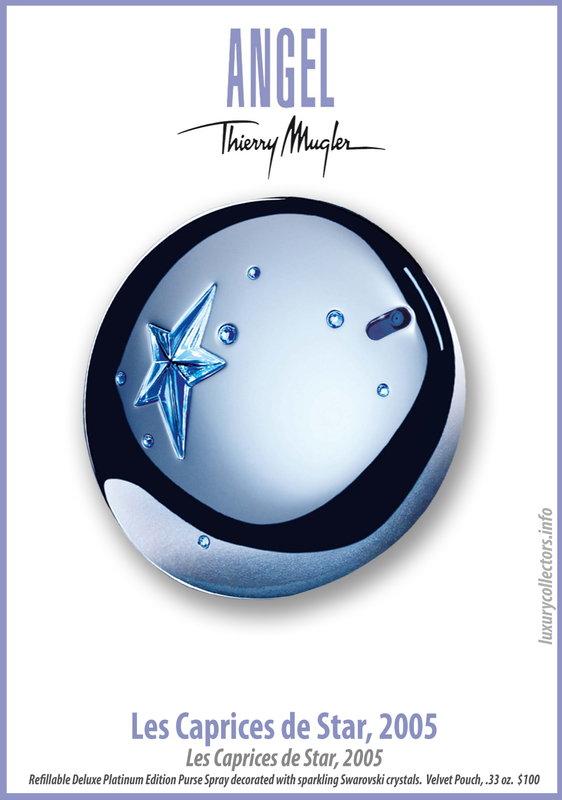 This is one of those moments when Thierry Mugler Parfums decides to change things a bit by offering a Limited Edition Purse Spray instead of the classic limited edition crystal bottles they have been releasing previously. In addition to this Deluxe Platinum “metallic” limited edition Purse Spray, they also release a trio of Midnight Collection companions (face powder, body powder and second purse spray) to complement the Angel fragrance line. Embellished with Swarovski crystal elements, this round purse spray is made of metallic looking plastic with a refillable bottle inside of the casing. The price ($100) is also more accessible than the crystal perfume bottles. It came in a dark velvet pouch. I have not found any information as to this edition being numbered. These Deluxe Purse Sprays also tend to blur the line between what is available constantly and what is a limited edition. 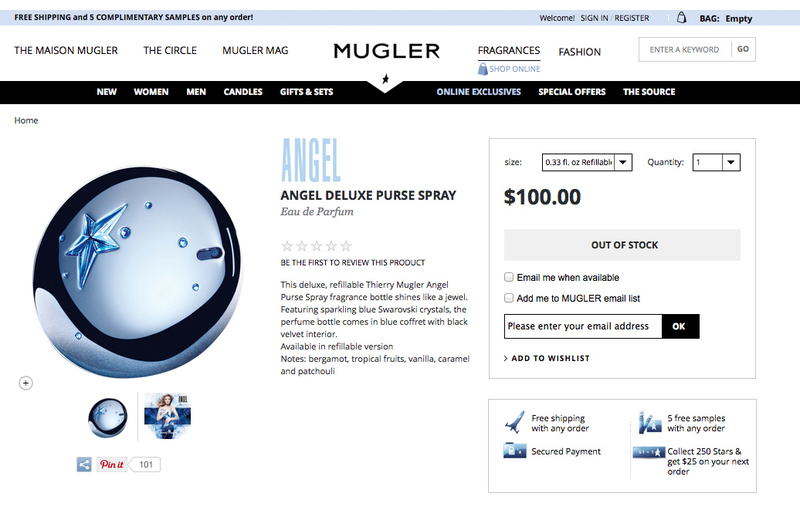 These round metallic purse sprays I have seen them recently on mugler.com website and also at Nordstrom.com. Available years later, this Deluxe spray seems to be identical to the 2005 Limited Edition Caprice de Star. This is the regular Deluxe spray in a silver metallic finish. From a Saks Catalog. This is the regular Deluxe spray in a silver metallic finish. From Nordstroms website. This version was available for a longer time than Caprice’s year. Deluxe Refillable Purse Spray in Black. Compact Face Powder in Metal case. Pearly Body Powder in Metal case. Retail Price $100, $120, $55 US dollars. The Midnight Collection was composed of three items: A Midnight Purse Spray, A Compact Face Powder, and a Body Powder. 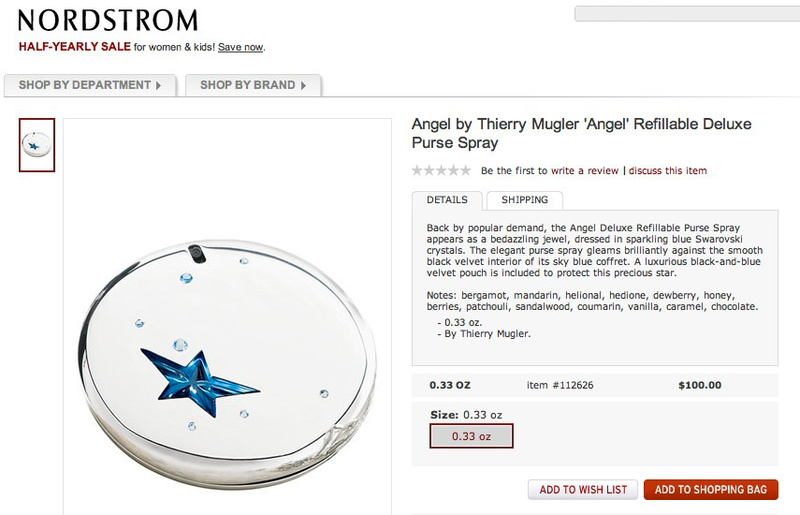 The Midnight Collection Purse Spray is very similar to the Caprice de Star of this same year, but in a dark metallic casing instead of the silvery blue casing of the Caprice. They retailed for the same amount, both contained Swarovski crystal elements. I am not sure where I read that this Midnight edition was signed and numbered. Signed I am sure refers to the Thierry Mugler logo inscribed into the casing. 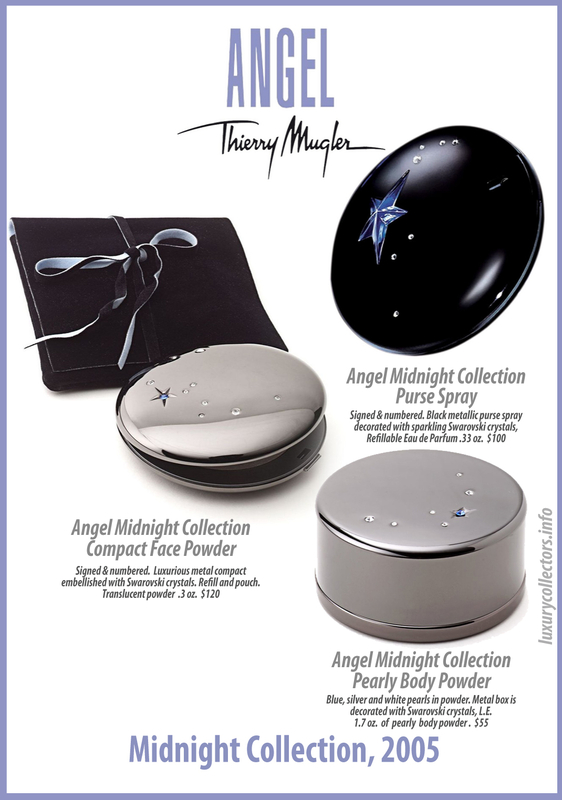 The Angel Midnight Collection Compact Face Powder is made out of metal and embellished with Swarovski crystals. It came with a refill and a pouch. The translucent powder came with the fragrance of Angel. It retailed for $120. 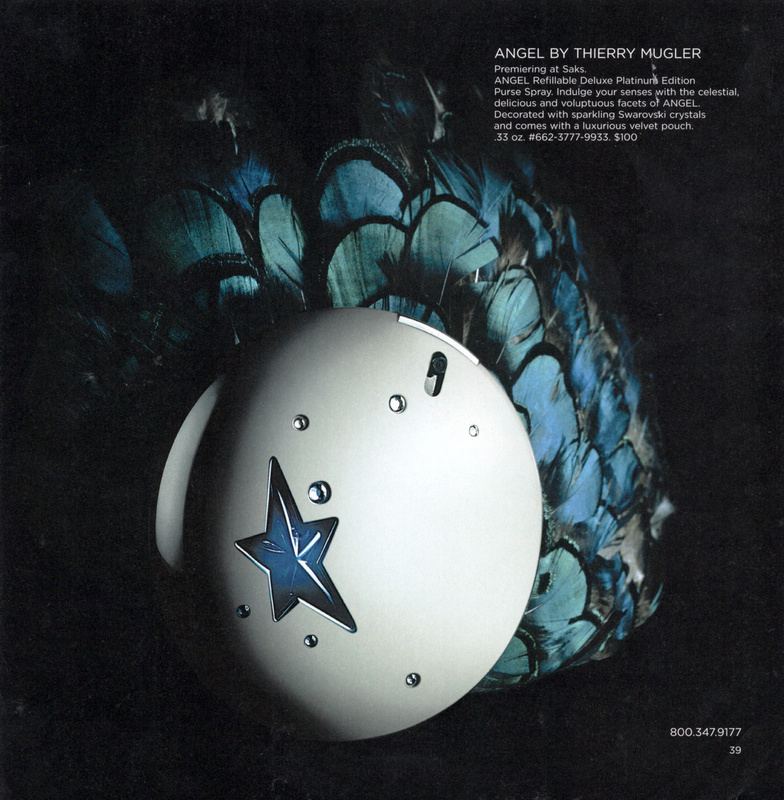 The Angel Midnight Collection Pearly Body Powder consisted of Blue, Silver, and White Beaded Pearls in powder form, encased in a metallic container embellished with Swarovski crystals and Blue Star. Very similar to Guerlain’s Illuminating Powder Pearls, they provide a luxurious way of applying the Angel scent to the body. It retailed for only $55. Although all these pieces are very nice, I feel that they skipped a year with the limited edition bottles.